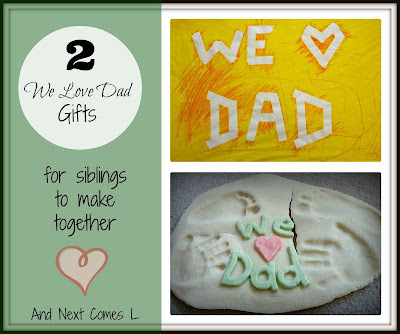 Father's Day is just around the corner and I am here to hook you up with two easy crafts that children of various ages can make together. So whether you have a baby, a toddler, or a preschooler, either of these crafts will be perfect for them to make for their daddy. First up, is the tape resist art project. Write out the words "We heart Dad" using tape on a large piece of paper. I used a piece of easel paper. I also taped the paper to the table so it wouldn't move. 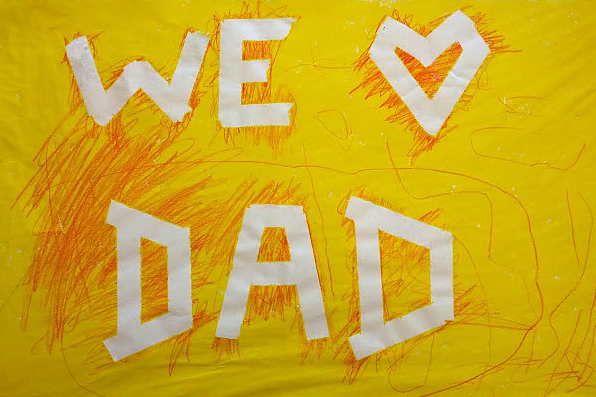 "We heart Dad" in tape. 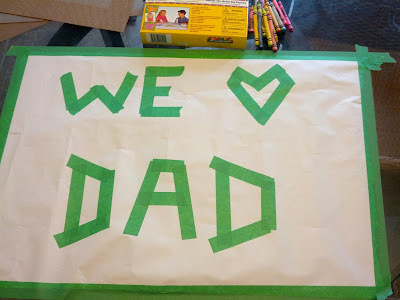 Have your children decorate the paper using whatever craft supplies you'd like (finger paints, crayons, markers, paints, etc.). J wanted to use Do-A-Dot Markers and crayons. While K was napping, J started to color the paper using the dot markers. Now if you want to keep a preschooler busy for 30-40 minutes, give them a large piece of paper and dot markers. Yes, J covered the paper one dot at a time for nearly 40 minutes. 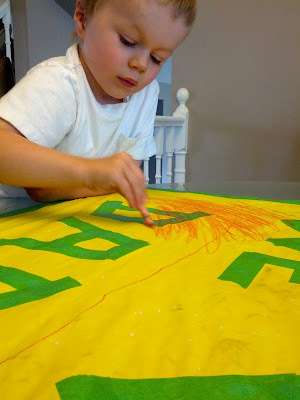 And he insisted on using only one color: yellow. J covering the paper with a dot marker. K wanted to help decorate the paper once he woke up from his nap, and that was my original intention anyway, but after all of J's hard work, J didn't want to let K help. However, I think if K had helped with the initial stages, it would have gone a lot differently. Anyway, J proceeded to decorate the paper using a red crayon. Adding another layer of color to the picture. Then we peeled off the tape to reveal the "We heart dad" message. 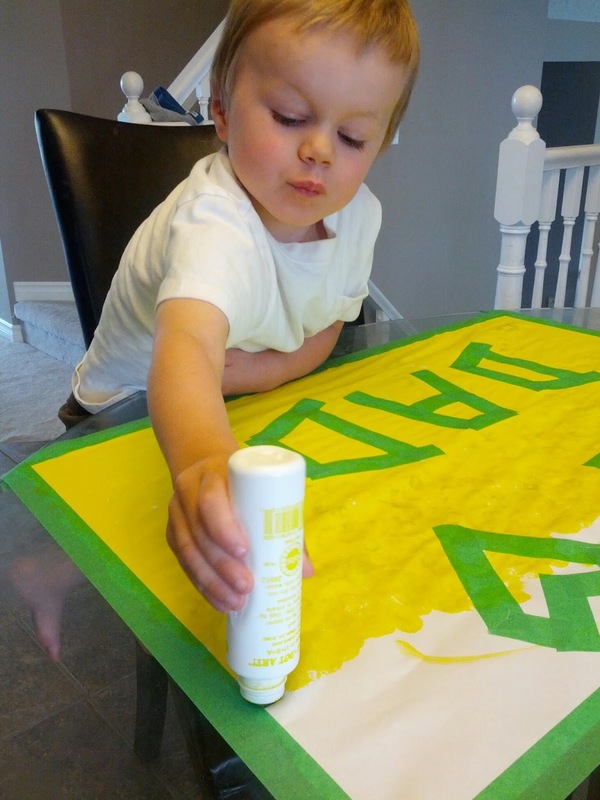 Last year, K was under a year old so he wasn't really into crafts yet. 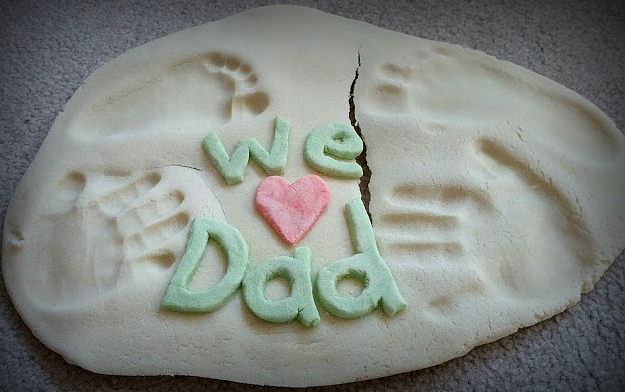 However, we made this simple craft together using salt dough. I followed the instructions found here. Both J and K each did a handprint and a footprint. 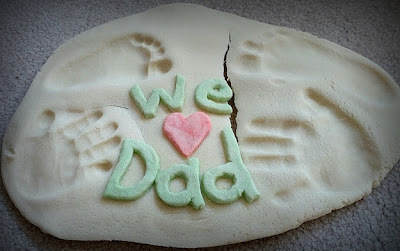 Then I mixed some food coloring with some salt dough to make the "We heart Dad" message. Unfortunately, our plaque cracked while drying out due to a wrinkle in the parchment paper that was underneath. Regardless, it turned out to be an amazing keepsake and a lovely gift for my husband. The finished salt dough plaque. Ah thanks for featuring me, Vanessa! And yes, we LOVE Do-A-Dot markers!